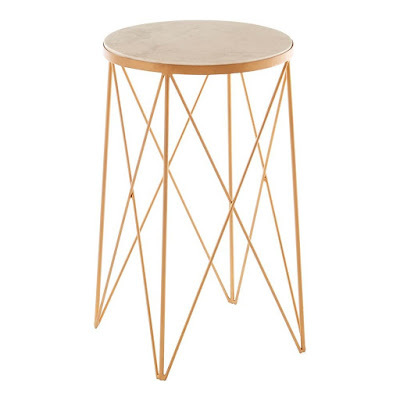 Not just somewhere to put a glass down or lamp but to make a statement or add to your décor, Houseology has a superb edit of side tables in different finishes and sizes. A circular slab of natural marble helps the handcrafted Templar table to achieve its luxury look. 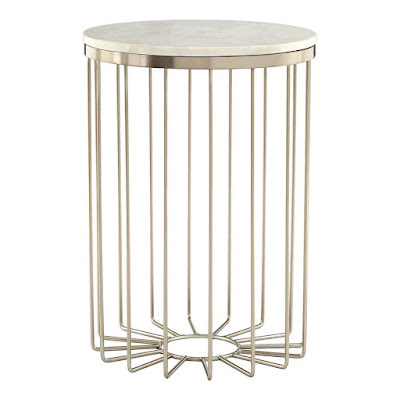 With a series of cylindrical iron rods emerging from its small circular base, each one kinked to allow it to rise in support of the round white marble table top. A corresponding band of iron is wrapped around the summit, forming a barrier between the rods and the marble.The marble top sports a series of irregular veins and mottles that subtly decorate its white surface. 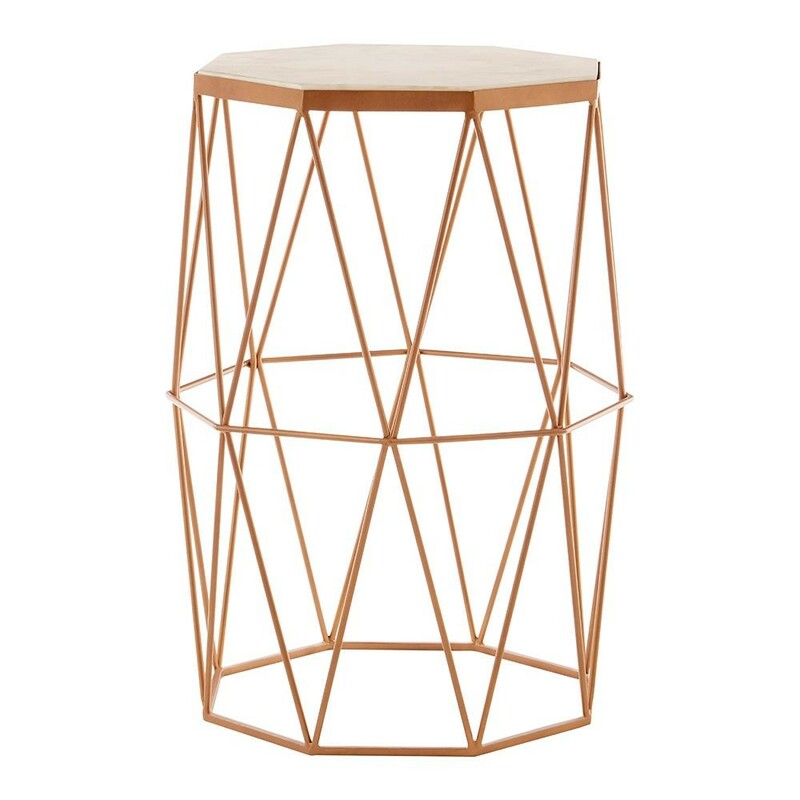 Inspired by geometry, this distinctive designer side table is a small piece of pentagonal precision designed to enhance contemporary interiors. 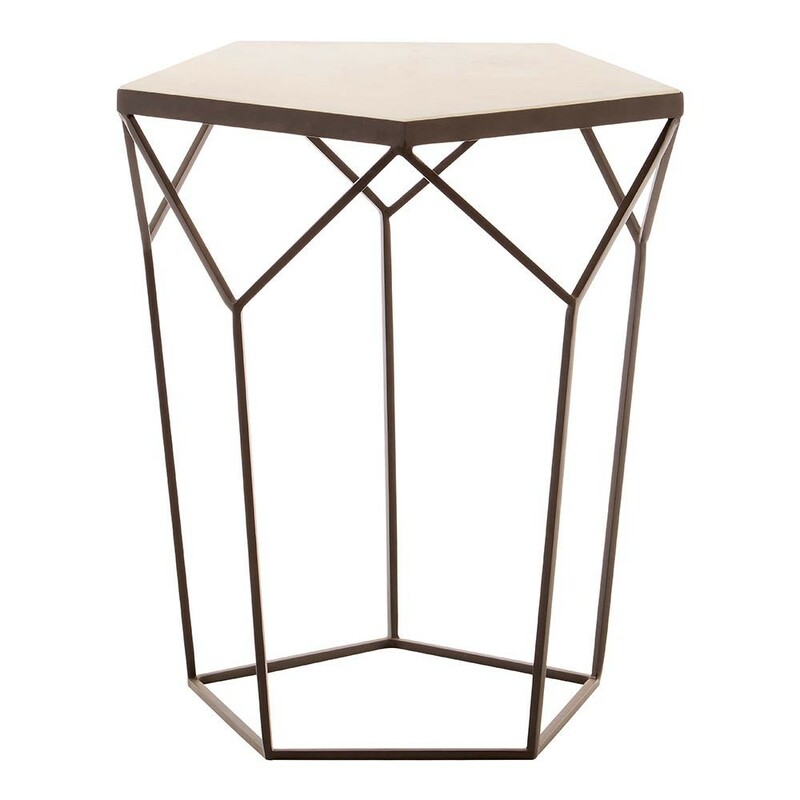 A polygonal slab of natural marble is inset into the table's top section, boasting a white finish that combines with the black base to give it a monochrome look.The base is made from smooth iron, and uses angled lines to create triangular shapes that complement the pentagonal top. 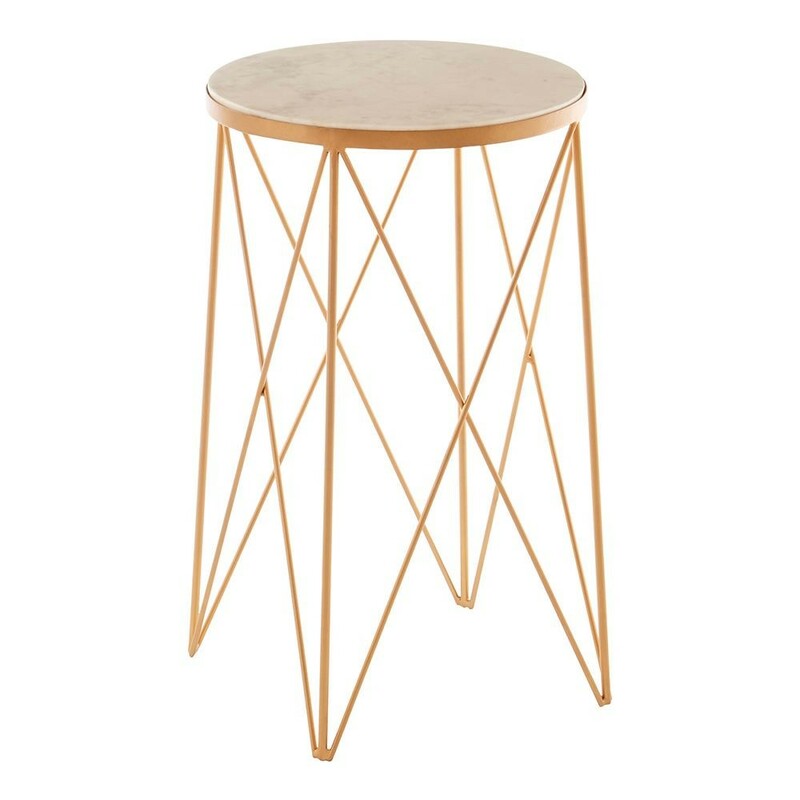 Embracing an indulgent mixed material aesthetic, this designer side table is perfect as a rich accent piece in Luxe interiors. 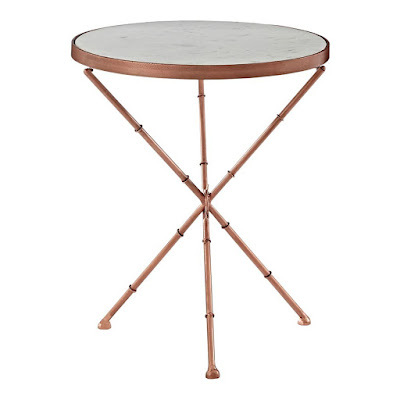 Its three legs form a tripod made from iron with a copper colour distressed finish for added character. Each leg features round washer detailing that disrupts the clean lines of the legs and rounded feet keep the table positioned firmly in place. 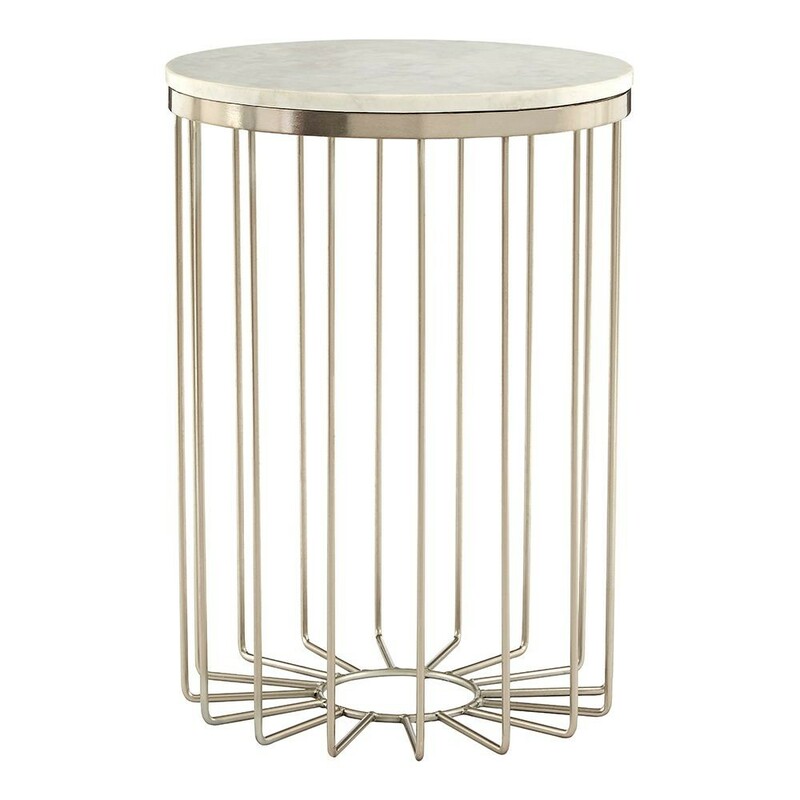 Lightweight yet robust and flexible, the table is ideal for having on hand as an additional surface when entertaining friends in your lobby or bar area. The table top is then formed from a single piece of white marble, set into a copper coloured iron clasp. 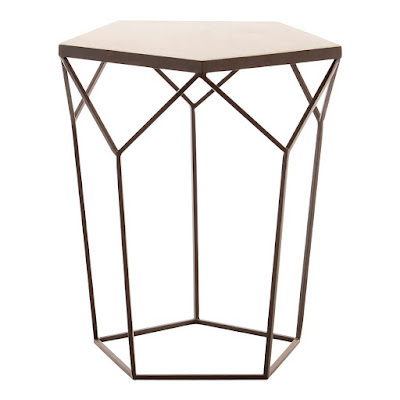 Inspired by geometry, this designer side table uses slender iron lines to create a graceful, en pointe impression. 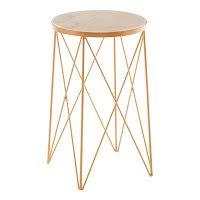 A disc of natural marble is inset into the Shalimar's iron top section with a crisp white colourway to complement the reflective gold of the iron.The legs emerge from the top iron band at a slight angle, meeting the floor in a curve before forming a lattice that gives it a fluid and geometric look. Use it to add a little boutique hotel luxury to the living room or add to either guest bedroom bedsides for a striking sense of style symmetry. 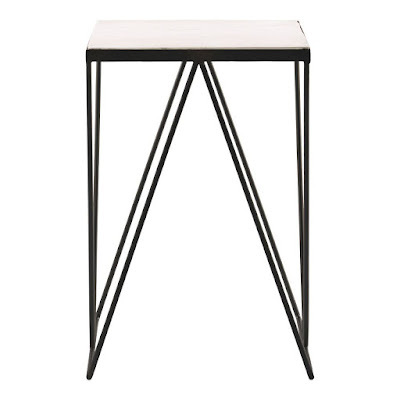 White and matte black tones give the Shalimar side table a monochrome aesthetic.The table's slim legs are made from strong iron, and are formed into a delicate shape that expresses fluidity. This contemporary accent piece can be styled with opulent boutique hotel furniture or minimalist Danish pieces for a dramatic contrast.The top of its frame is raised to allow the slab of natural white marble to be inset, resulting in a smooth and level surface area. 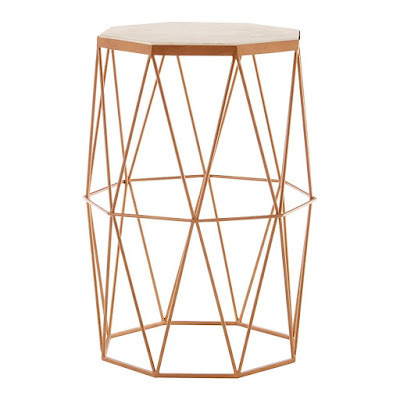 Adding geometric design style to the living room, its iron frame is formed out of a series of triangular motifs that combine to create an inverted symmetrical shape.The gold colour finish allows it to be styled with warm and reflective metallics as the white marble tabletop creates a pristine pedestal for resting drinks or a designer table lamp on top.